Paul Rushton is a Clinical psychologist and the Managing Director of PRA Psychology. He has been a psychologist since 1991. He has extensive experience in a range of areas including clinical psychology, government mental health services, performance coaching and employee assistance. 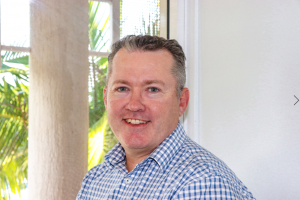 He has held adjunct academic appointments as a Clinical Assistant Professor at Bond University, Lecturer at Griffith University, and Sessional Lecturer with the Medical School at the University of Queensland. He worked in Queensland Health mental health services for over a decade and held senior positions including Senior Clinical psychologist and Manager of the Gold Coast Mental Health Service with over 200 staff. Paul Rushton specialises in assisting clients with a range of problems including anxiety disorders, trauma, and life coaching. He has a passion for helping people improve their lives. In particular he has expertise in helping people understand themselves better and what stops them achieving their goals, having the relationship they want, and achieving their dreams. Paul provides performance coaching for clients wanting to improve their lives in specific areas such as their business or sporting performance. He has provided consultancy for sporting organisations and other mid-size organisations over many years. He has extensive experience with emergency services personnel including police and ambulance employees. Due to his years of experience he is adept at meeting the goals of clients ranging from those wanting sessions to ‘offload’ thoughts and feelings, to learning strategies and skills, to changing unhelpful thinking and emotional patterns, to achieving a deeper-level understanding of themselves, to resolving chronic and complex problems. Paul regularly provides training workshops across Australia and overseas including training staff within the Singapore Government in Cognitive-Behavioural Therapy (CBT), Interpersonal Psychotherapy(IPT) and Mindfulness. He is recognised as one of the leading experts on IPT in Australia as evidenced by the Australian Psychological Society and PsychOz sponsoring him on workshop tours around Australia. He also regularly provides training for psychologists and other professionals in the practice of CBT, Mindfulness and IPT.